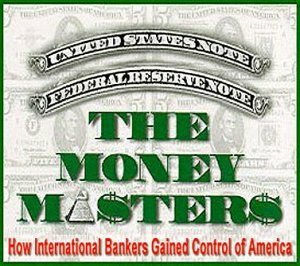 The Money Masters is a 1995 documentary which explains the history behind the current world depression and the bankers’ goal of world economic control by a very small coterie of private bankers, above all governments. It discusses the concepts of money, debt, and taxes, and describes their development from biblical times onward. It covers the history of fractional-reserve banking, central banking, monetary policy, the bond market, and the Federal Reserve System in the United States. It's the Zionists. Let's call a spade a spade.